Keeping abreast of events of the world and also concerned about the possibility, although very remote at the time, that the horror that destroyed Tokyo in 1954 would return, the Japanese military sanctioned development of new weapons to keep pace with the rest of the world's armies. After seeing the others use rocket launchers in their armies, the Japanese Self-Defense Forces soon followed their lead. Starting with research and development in 1965, the Japanese Ground Self Defense Force developed a suitable rocket that troops could fire from a vehicle en masse in 1973. In 1975, the new weapon entered service with the JGSDF with the rocket launcher fixed onto a Type 73 APC, complete with the 12.7 machine gun that was part of the construction for the standard Type 73 APC. 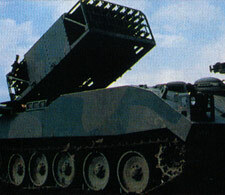 The launcher carried 30 130mm fin-stabilized rockets that could they could fire one at a time or let loose all at once. Another Type 75 armored vehicle accompanied the Type 75 MSSR and would provide targeting information to ensure that the rockets launched from the Type 75 MSSR landed on their intended general target. However if the situation called for it, the Type 75 MSSR can work alongside the other AFVs of the JGSDF in direct fire support. While they would not have to fire their 130mm rockets against a human enemy, they would see action when the horror that destroyed Tokyo in 1954, better known as Godzilla, returned to the world of the living. Alongside Type 74 tanks and Ballistic missile launchers, the Type 75 MSSR showed up as one of the vehicles to attack Godzilla from the docks, should he show up. Time passed and after bringing down several fighter jets and forcing Godzilla to dive under the waves, he emerged shortly after. There, the awaiting Type 75 MSSR and other vehicles rained down their payload along with the rest of the defense at Tokyo Bay. However, Godzilla took all that the soldiers and vehicles had to give and returned the favor with a long blast of his atomic ray, effectively reducing any resistance to a line of flaming rubble. Releasing a roar of triumph, the beast climbed from the docks and proceeded to terrorize Tokyo. Five years later, the Type 75 MSSR would see combat against Godzilla again while trying to heat him up with the M6000 T.C. system at Wakasa Bay. There, they fought alongside the other AFVs of the Ground Self Defense Forces to pin Godzilla down while the minefield that was powered by the Thunder Control System activated the Anti-Nuclear Energy Bacteria, which was infecting Godzilla's body. While they did contribute to the attack, the Type 75 MSSRs could not keep Godzilla pinned down in the TCS minefield and not surprisingly, they suffered losses as they fought on the front line against the monster. Biollante was eventually the one who would succeed against Godzilla where the JGSDF failed. Later when the Japanese found a UFO had landed on their soil, the JGSDF surrounded the UFO with Type 75 MSSRs and other AFVs but fortunately did not have to attack the UFO. For most of the remaining duration of the new crisis, the Type 75 MSSRs not only faced Godzilla but also faced the possibility up going up against other monsters such as Battra and Mothra.